Students need to classify in a two column table if a noun is a proper noun or common noun. Also need to write the proper nouns using upper case in the first letter. The present downloadable worksheet is best suited for elementary school students at Elementary (A1) level. 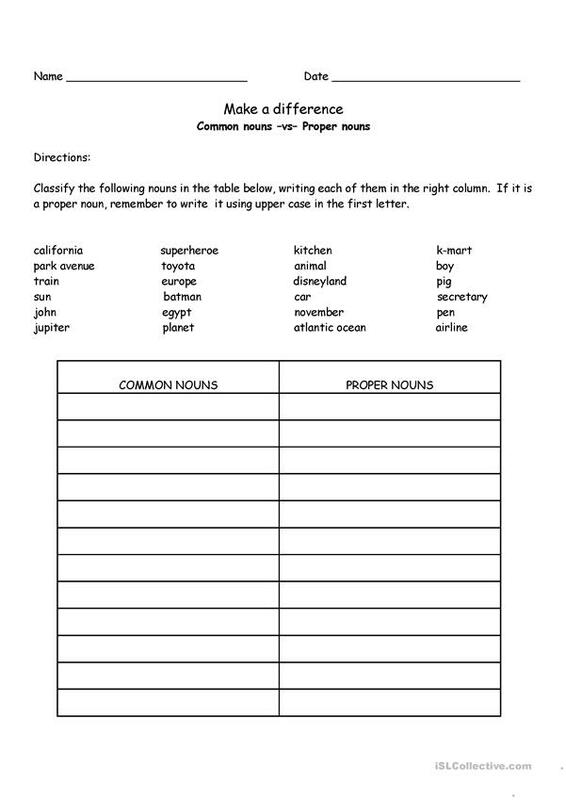 It is a useful material for consolidating Nouns and Nouns: Proper nouns (names of people, cities, companies) in English, and is excellent for developing your class' Writing skills. It focuses on the vocabulary topic of American/British English. lvargas is from/lives in Puerto Rico and has been a member of iSLCollective since 2012-04-24 00:25:18. lvargas last logged in on 2019-01-25 10:36:38, and has shared 1 resources on iSLCollective so far.